On the back of the recent release of another Microgaming slot based on a classic cult movie, ‘Halloween’, the gaming software moguls have deemed in their infinite wisdom that “There can be only One” and have announced a release for their new ‘Highlander’ online slot. 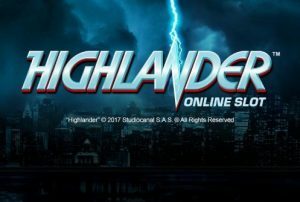 Microgaming has recently signed a licensing agreement (brokered by Creative Licensing Corporation) with French studio production and film distribution company Studiocanal to begin development on the Highlander online slot, based on the original movie from 1986. It’s the cult film that made Christopher Lambert a worldwide star and introduced a generation of post-007 film goers to the sublime acting skills and Scottish brogue of Sir Sean Connery. It is said Sir Sean landed his Oscar-winning role in “The Untouchables” on the strength of his comeback screen role in The Highlander. The video slot will definitely offer plenty of classic movie material for an action-packed game that will no doubt be enjoyed by an army of Highlander fans across the globe. The first of the series of films and later TV Series spin-offs, “Highlander” was directed by New Zealander, Russel Mulcahy and was released on March 7, 1986, with the now world-famous tagline “There Can Be Only One.” Highlander gained significant success worldwide as one of the most iconic modern fantasy films. It has become a cult classic, and has spawned four sequels, a television series (as many of we Canadians are aware the TV show was shot mostly around Vancouver in British Columbia) and several other animation spin-offs. Highlander will be one of the first movies to go straight to being an online slots title before becoming a video game. The movie’s immortal swordsman from the Scottish Highlands, Connor MacLeod is coming back in this online slot and will once again battle with his legendary foes, the Kurgan. With the story is set between a New York City of 1985 and historical medieval Scotland, we expect that the 2017 release will offer lots of rewarding pop-ups and features covering this broad period of history. According to the officials of Microgaming, the slot will follow the move theme to the letter, and it will capture the magic of the movie that was immensely popular over thirty years ago. With the game not entirely completed and still in development, Microgaming officials have decided to keep the games information close to their chests. However, some minor details have been mentioned, regarding the release date and the game layout. The slot will go public on 6 December 2017 to all Microgaming Online Casinos worldwide (Spin Palace, Ruby Fortune, Betway, Royal Vegas and Jackpot City amongst others) and will feature five reels and offer 243 ways to win. The main characters from the movie will definitely be involved, so expect Connor MacLeod, the Kurgan and Brenda J. Wyatt to definitely appear on the reels. We are still to learn whether the developers have decided to include Connor MacLeod’s wife Heather or his mentor (as played by Sir Sean Connery), Juan Sánchez Villa-Lobos Ramírez. As for the special features that may be incorporated into the Highlander online slot, the good people of Microgaming have kept their lips sealed, and we can only surmise what parts of the movie might be used for Free Spins, Bonus Games, or some other special game features. We can only hope the main feature will definitely involve the battle between MacLeod and the Kurgan. We’d like to believe so. The soundtrack of the Online Slot promises to be fantastic too, since the movie itself had an amazing soundtrack, with lots of songs that later became huge hits, like Queen’s ‘Who Wants to Live Forever’, and the Highlander theme. David Reynolds, continued, stating that the Highlander video slot will boast “blistering guitar tracks”. In the meantime, to keep you entertained until Highlander’s December release date, Microgaming has plenty of movie-related Online Slots at any of their Online Casinos like Spin Palace, Ruby Fortune, Betway, Royal Vegas and Jackpot City. With Microgaming, you’ve got great games like The Dark Knight Rises, Bridesmaids, Jurassic World, Terminator 2 and the recently released Halloween. However, when it comes to my favorite online slot based on a movie, I can’t go past the new Playtech slot, based on the 1999 cult cinema production, ‘The Matrix’. Maybe it’s my personal bias. To this day, I am an utter Matrix devotee. On the other hand, maybe it’s just a great game. The Matrix slot offers plenty of substance to go with its iconic visuals and style. It is a 5 reel and 50 payline set on a background is made up of green code. 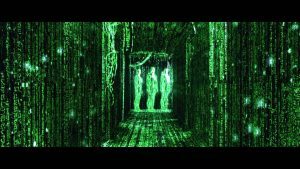 All the film’s characters pop up including Agent Smith (Hugo Weaving), Morpheus (Laurence Fishburne) and Trinity (Carrie-Anne Moss). Other symbols include a phone, iconic matrix glasses and four different codes. There are two wild symbols in this game. The first is the Neo wild (Keanu Reeves) and he replaces all other symbols other than the free games scatter to form wins. He offers up the highest wins for spinning in five of a kind. You can receive unlimited free Spins with Sentinel Wild Symbols by selecting the Blue Pill or you can select 8 Free Spins with Extra Agent Smith Symbols with the Red Pill. The choice is entirely yours. The Matrix online slot is an exciting new game to play and it will appeal to a wide audience across all Playtech’s online casino’s including William Hill.